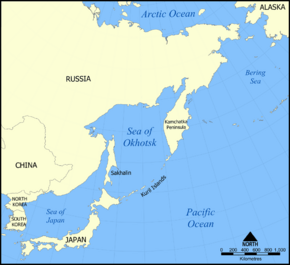 Location of the Kamchatka Peninsula in the North Pacific east of the Sea of Okhotsk near Asia's northeast corner. The Kamchatka Peninsula is a long body of land jutting dramatically from Russia and Asia's northeastern tip, with a length of 1,250 km and an area of 270,000 km². It hangs off eastern Siberia along a general north-south axis, Florida-like, between the Bering Sea to the east and the Sea of Okhotsk to the west, each an arm of the Pacific Ocean. About the size of New Zealand, it is one of the largest peninsulas in the world. Its shape has also been compared to a giant fish, with the head at the south. There are just over 400,000 residents, but the population density is one of the lowest in the world, less than a person per square kilometer. The peninsula's isolation, beauty, and abundance of wildlife make it a very likely long-term candidate for tourism development, particularly for an environmentally minded and adventurous clientele. The part of the Kamchatka Peninsula that connects in the north to the rest of Russia is only about 400 km south of the Arctic Circle. The "Ring of Fire", the belt of seismic and volcanic activity that roughly encircles the Pacific, passes directly through the peninsula. More than 160 volcanoes dot and hold sway over the landscape, 29 of them still active. The cold climate and the volcanic rumblings and eruptions have given the peninsula the name of the "Land of Fire and Ice." A volcano is probably at least smoking or steaming somewhere on Kamchatka at any given moment, and though there are some huge explosions (as recently as 2004), they produce very few human victims because of the summits' remoteness and the sparseness of the peninsula's population. Great differences in climate appear along the length of the Kamchatka Peninsula. While the northern reaches clearly lie in the subpolar zone, the central area has four distinct seasons and the seacoasts are likewise moderate. The longest stream is the Kamchatka River, running nearly 700 kilometers from south to north, creating what's called the peninsula's central valley, which is flanked by large volcanic ranges. It is claimed that here are the world's highest density of volcanoes and associated volcanic phenomena. The highest of these is Klyuchevskaya Sopka (4,750 m), while the most striking is Kronotsky, the perfect cone of which is considered by some the world's most beautiful volcano. In the center of Kamchatka is the increasingly renowned Geyser Valley, with its steaming fountains, thermal lakes, and bubbling mud pots. Most inhabitants live in the regional capital, Petropavlovsk-Kamchatsky (named for saints Peter and Paul), a seaside city of about 220,000 founded on the southeastern side of the peninsula by the explorer Vitus Bering, but a traditional way of life can still be seen in many scattered fishing and mining villages. 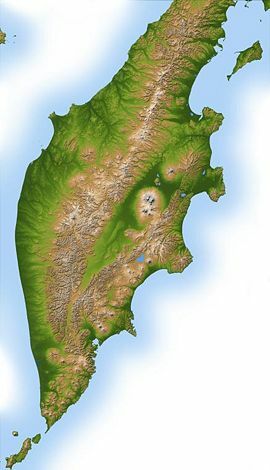 The Kuril island chain runs from the southern tip of the peninsula to a short distance from Japan's northern Hokkaido Island. The Aleutian Islands arc thousands of kilometers from southern Alaska toward Asia. The westernmost islands in the chain are Russian territory, not American, and lie about 200 km from the middle coast of the Kamchatka Peninsula. Between the peninsula and the Bering Sea runs the Kuril-Kamchatka Trench, with a depth of 10,500 m, similar to but not as deep as the trench that parallels the southern coast of the Aleutian chain. There have been very strong earthquakes that have shaken Kamchatka in the past (1952 being the most recent), all centered in the Kuril-Kamchatka Trench. In the seventeenth century, the Russians began exploring what they claimed as the eastern reaches of their dominions. The first Russian maps showing Kamchatka as a peninsula appeared in the 1680s, and continued to improve in the next decades following Bering's expeditions to eastern Russia and Alaska. Russian fur traders first established posts on the Kamchatka River, but they nearly brought the indigenous tribes they were trading with to extinction via encroachment, warfare, and disease. Small native groups still exist dispersed around the peninsula, relying on fishing, reindeer herding, and some tourism for their livelihood. Russian Orthodox missionaries were close behind the traders and worked in a large area that included all the Aleutians. The faith and the language they spoke remain the ones in use on Kamchatka today. During the Soviet era, several military bases were located across the peninsula, which prevented all foreigners and even most Soviet citizens from visiting. In addition, the military tested the range and reliability of their missiles by launching them from other sites, using the peninsula as the target area. When a Korean Air Lines flight strayed deeply into Soviet airspace in 1983, it first crossed the Kamchatka Peninsula before being shot down near Sakhalin. The fighter jets that brought its demise and that of all 269 aboard were scrambled from a base on the peninsula. 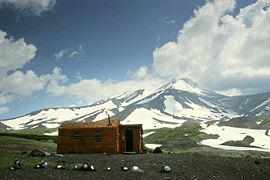 It was not until 1991 and the fall of the Soviet Union that Kamchatka started opening its doors for tourism. As in Alaska, the contrasts of nature—the snow and heat, glaciers and greenery, the sea and the clear sky—make the peninsula a near-certain growing draw for tourists and other visitors. A large military presence remains on Kamchatka and is blamed by some as the source of small but growing pollution. In the summer of 2005, a Russian Navy submarine was disabled in a submarine accident near the peninsula and sank to the seafloor, requiring an international effort to rescue the crew. Kamchatka is the land of volcanoes. Kamchatka has been called one of the last untouched places on earth. Its wildlife includes brown bears, snow rams, sable, wolverines, and golden eagles. The peninsula is also the breeding ground for Stellar's sea eagles, the largest eagles on earth. The world's largest and densest population of brown bears makes Kamchatka home, with a count estimated around 10,000. They are comparable in size to American grizzlies, but are known as relatively docile. The largest animals in the world, blue whales, are abundant near the coastline. As early as 1882, the peninsula's sea otter population came under protection. Currently about 2,000 sea otters inhabit parts of southern Kamchatka's shoreline. The peninsula is thought to include the world's greatest diversity of fish in the salmon family. Accordingly, one lake, Kurilsky, is recognized as the largest spawning ground for salmon in Eurasia. There are also many varieties of trout. This page was last modified on 3 April 2008, at 22:03.